Ever since I was little, I wanted a four poster bed. But somehow it eluded me. Until today. Well it's all finished today, anyway. The best part is, it looks the exact way it did in my head. The hard part was getting it out of my head and built. But that's where I look to my-new-best-friend-who-doesn't-know-I'm-her-new-best-friend Ana White. She is is a mom and super talented furniture builder. She takes ordinary pieces of wood from big-box stores and creates anything and everything. I always have ideas in my head of things I wanted to build, but before ana-white.com, I didn't know how to go about it. Now I've discovered a whole new world and there's no going back! 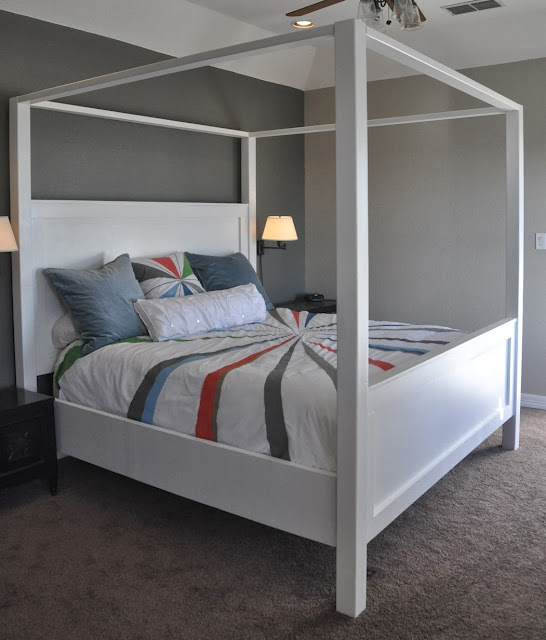 I started with a couple plans from her site, the King Farmhouse Bed and Farmhouse Bed Canopy and customized it to exactly what I wanted. I love her Farmhouse bed plans but wanted a little more modern take on the bed. And since it's always been a dream to have a four poster, I had to include the canopy. Details and dimensions for this king bed can be found on Ana's site, and the modifications I made are here. To make the headboard and footboard, I started with 3/4 inch birch plywood and premium pine 1 x 4's and cut the 1 x 4's to length and width. Then I attached the 1 x 4's with wood glue and finish nails. The bed rails were made of 2 x 12's, and I attached a 2 x 2 to the bottom with wood glue and wood screws. The 2 x 2 will support the 1 x 3 furring strips that will be attached later to hold the box springs and mattress. I cut the 4 x 4's (for the posts) to 88 inches, which is higher than most four poster beds. I have a high ceiling so I knew it would work. I also measured all of my door frames on the diagonal to make sure they would make it into the house. I then took the 4 x 4's and the 2 x 4's (for the canopy), along with the bed rails, and set them up, ready to be painted a coat of primer. Now because I wanted this bed to look modern instead of rustic, I spent quite a bit of time prepping each piece of wood--sanding, filling holes, sanding, filling holes, sanding. Over and over and over. The prep work was a beast. I have painted my fair share of furniture in my life, all with brushes, spray paint cans, or foam rollers. I felt with this huge project I was ready to graduate to the next level. And you know how I like new tools! I purchased this Graco TrueCoat Plus II (a handheld electric airless paint sprayer) at Lowe's with a 10% off coupon. One of my best. tool. purchases. ever. In about 15 minutes. My daughter was kind enough to point out that I painted half of the hedges too. Then I primed the foot board and headboard. Such a smooth finish, I love this sprayer! After they dried I stacked all of the pieces in my already full garage for awhile until I had time to pull it all out again. I need to pre-drill holes into the side of the headboard and foot board, so I made a template out of paper and ran it along the sides to mark where to drill the holes. For extra stability, I used 4 1/2 inch hex bolts to attach the posts to the headboard/foot board. So that my hex bolt drill bit could fit into the pre-drilled holes, I made 3/4-inch diameter holes halfway into the 4 x 4 and then pre-drilled the rest of the way through the 4 x 4 with a standard drill bit. I set the headboard and foot board up on tables and line up the 4 x 4. I shimmed, leveled and straightened the 4 x 4 until it was in the exact right spot and drilled the 4 1/2 inch hex bolts through the 4 x 4 into the headboard and foot board. I used clamps to keep it in place while I drilled, and checked level each time I inserted a bolt. Foot board done, check! Mind you, this was all done BY MYSELF. No husband home to help me lug these huge pieces of wood around. I just used lots of tables and whatever leverage I could to move them around. Because we've moved around a lot I wanted to find some hardware that would make it easier to assemble and disassemble the bed, which actually came in really handy as I set it up and took it down to paint and store. I ordered the Bed Snap 930 Heavy Duty Wood Rail Bed Fitting from ebay. It was $37 which is kind of pricey for hardware, but I decided it was worth it. I created plugs for the hex bolt holes with 3/4 inch dowel that can be found at any hardware or hobby store. I had help to set it up, this bed is massive! And then after another sanding, hole filling, and sanding again, this bed was ready for a final coat of paint. Here is me spraying in action. You have to wear a mask while spraying otherwise you will coat your lungs with paint. I think I want pink lungs thank you very much. The biggest pain with this bed was the shear size of it, nothing was simple and easy. After letting the paint dry (and the finish was gorgeous!) we expected freezing temps and rain. So with the posts attached the headboard and footboard wouldn't easily fit in the garage anymore. So in they came until the weather cleared up. And then back outside for a final coat of Polycrylic. Polycrylic is a water-based polyurethane type product that won't yellow white paint. I've used it with great success in the past, applying it with a brush or foam brush. The sprayer poured it on. I had to move super fast to get the right amount of coverage without drips. Ugh, it was not easy. I had to sand down and re-do some part of the headboard, but overall I am happy with the finish. The bed then came up to the Master bedroom. I built a center rail out of 2 x 4's, and attached 1 x 3 furring strips across the board from the 2 x 2's on the rails. I pre-drilled all the holes and it was all attached together with wood screws. I attached the canopy using L-shaped hardware in the lumber department of Home-Depot. I wanted the canopy to look like it went straight into the posts (as opposed to on top of the posts) so I used this hardware recommended by Ana White. I don't know if it was the height of the bed off the ground (10 inches) or the shear massiveness of the bed, but it didn't seem as stable as it should be with the hardware I bought to attach it. I fixed the problem pretty easily with some 1-inch L brackets. It was just the right amount of extra support. And since by design sensibilities wouldn't allow me to use my Ivory duvet I had with my new white bed, I hand-painted a new one. I'll tell you about that next! 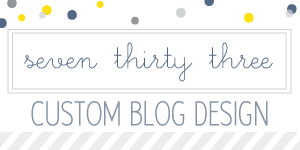 This post is linked with Remodelaholic & Miss Mustard Seed! Gorgeous! Can't wait to see the details on the handpainted duvet! Friend, You are my rockstar. Can you say beautiful? Man, you are one talented friend. I had to show Cannon what a beauty this is. You are so amazing. Love ya. This is fantastic! Not only are you super talented, you have the determination to see the project through to its beautiful finish. I agree with your father. You did a great job. Jen...I am speechless. You are truly a talent! LOVE your new bed....amazing and LOVE the new bed spread. Hugs! Beautiful! You make me want to make this right NOW!! decor sanity...more like Decor Insanity!! So impressive Jen. Love how it has a modern look to it. Oh. My. Goodness. I am so impressed that you made this bed yourself!!! Like, beyond words impressed. It turned out amazingly! Pinning! Visiting from Miss Mustard Seed's link party. AWESOME! 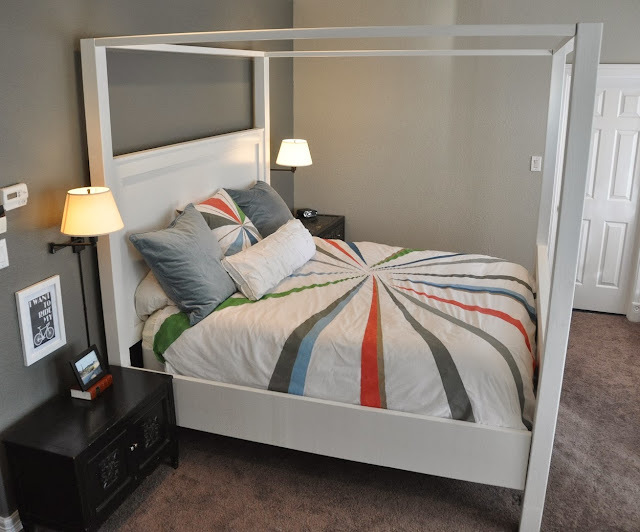 I've always wanted a canopy bed! How much do you think it would cost to build a queen size one? approximately? Great work! I'm uber inspired! My husband and I just built one for $189 in lumber and the bolts we needed to assemble it. We even added to it and mounted our t.v. in the top, above our heads. We like the rustic plain look so we did not paint or stain the wood. I absolutely love it. This looks great. In the pictures are you using a boxspring or are the 1 x 3 slats supporting the mattress? okay so now if you were to add a netting/drape canopy what fabric would you use.